Karen Wong grew up in Canada with diverse musical interests. She was educated in piano performance in the western classical tradition, graduating with honours from the Oberlin Conservatory of Music in 1997. 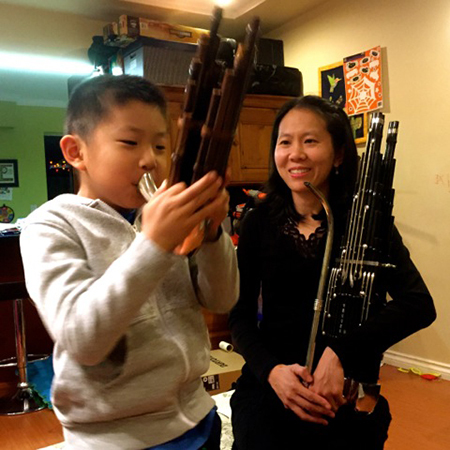 She also studied Chinese wind instruments growing up in Vancouver. Her fascination with performance, history and culture led her to complete a Master of Arts in Performance Studies from New York University’s Tisch School of the Arts in 1999, where she wrote about evolving Chinese cultural traditions of music, performance and theatre. New York City enabled her to cultivate an interest in the Chinese sheng and perform with many professional Chinese traditional artists living there, in music ensembles as well as traditional and experimental opera and theatre productions. Since moving back to Vancouver in 2000, she has collaborated with the B.C. Chinese Music Association, performing with the large orchestral ensemble and teaching students. She has played and recorded on the sheng with a variety of small ensembles locally and abroad, performing traditional repertory, as well as new works by contemporary composers. Karen also holds a Master of Occupational Therapy degree from UBC. She is a practising occupational therapist who works with children and adults to achieve functional goals. Today, Karen enjoys bringing her knowledge of Western classical and Chinese musical traditions, and her experience from working in the art and science of rehabilitation, into a creative music teaching practice.